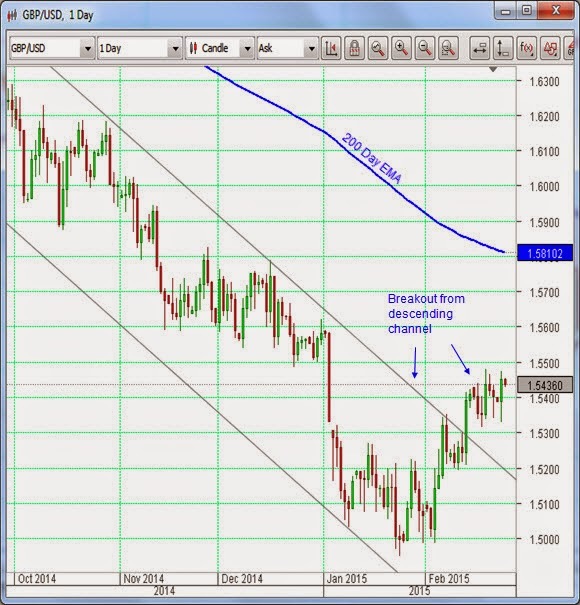 From a Technical Analysis (TA) point of view, the GBPUSD pair has been putting in a significant performance since the middle of this month (Feb 2015). A well-established down trending channel has been breached (see chart) and there is every sign that this can be sustained. If resistance at the 1.56 level can be overcome, then the next stop is the all-important 200 day Exponential Moving Average (EMA, blue curve). There is even room for a retrace of the new uptrend, as far as about 1.52, before it can be deemed to be a failure. On the fundamental side, the UK economy has been quietly robust for some time also. Despite some outlier leading indicators which might have tended to take the gloss off, the recent inflation report by the Bank of England, and the identification by the governor, Mark Carney, of the current bout of deflation as an unreservedly good thing for the economy, have all served to highlight the Brit potential. One of the things that have been dragging on the Pound Sterling (or Cable, as it is known in Forex circles) has been fears about the economic health of the UK’s largest trading partner, the Eurozone. Now a report out from Reuters indicates that, “below the radar”, there is growth here too, enough to impact the bottom lines of the largest EU companies. The survey by the international news agency has indicated that over 70% of the top firms see improvement in Europe. The effects of Eurozone Quantitative Easing (QE) are already being felt, as are the benefits of lower oil prices, and these are expected to continue to impact positively. The CEO of Renault SA told investors last month that European markets had recovered beyond that company’s expectations. While Britain and Germany are seen as the strongest markets, the recovery in southern Europe was also evident, according to many of the companies surveyed.